Berkswell is a fabulous place to live, work or enjoy your leisure in. Berkswell Parish has a thriving community, a rich and well-documented history, a superb rural environment and a good location close to several towns and cities, with transport links to the national motorway and rail networks. It comprises three broad areas. Berkswell village and its immediate surrounds, eastern Balsall Common with the railway station and a large rural area interspersed with hamlets and settlements/communities. Balsall Common has grown rapidly over the last half a century but has been an important part of the parish for long before that. The boundary between Berkswell and Balsall Parishes falls through Balsall Common but reflects a boundary dating back 1000 years marking the limit of the ecclesiastical boundary of Coventry Diocese. The Berkswell community in Balsall Common supported the existing parish boundary by overwhelming margins in repeated consultations carried out by Solihull Council most recently in 2018. Just over 50% of Berkswell Parish residents live in eastern Balsall Common. Berkswell Station, the Berkswell & District British Legion and the Berkswell Windmill demonstrate the links between eastern Balsall Common and Berkswell Parish. The historic centre of Balsall Common comprised the station, the adjacent Railway Inn (formally a railway hotel), the 17th century Brickmakers Arms, 17th Century Berkswell Stores (now apartments) and a butcher all on Station Road. In more recent years the shops have moved up the road towards the A452 with the first 6 retail premises being in Berkswell Parish, with the boundary just beyond the butcher and the delicatessen. Children from Berkswell Parish are entitled to attend the excellent village school in Berkswell village - a “right” taken up by many parents living in the east of Balsall Common. Similarly, the beautiful graveyard at St John Baptist Church in Berkswell village is open as the final resting place to all in east Balsall Common whatever their religion or none. Eastern Balsall Common is characterised by its easy access to the country and the wealth of “green” within its built-up areas. · Lavender Hall Park in the north is set between the Berkswell Gate housing development and the rest of Balsall Common. It offers a formal playground, football pitches, wild areas and wide-open spaces for play and dog exercising. Just to the north is the Hornets football ground predominantly for youth football and in the summer cricket. · The “Lant” is an area for tennis and cricket situated off Meeting House Lane in the centre of Balsall Common. The “Lant” is a charitable trust that owns the land and lets it to the tennis club and the Berkswell Cricket Club via a sports association. 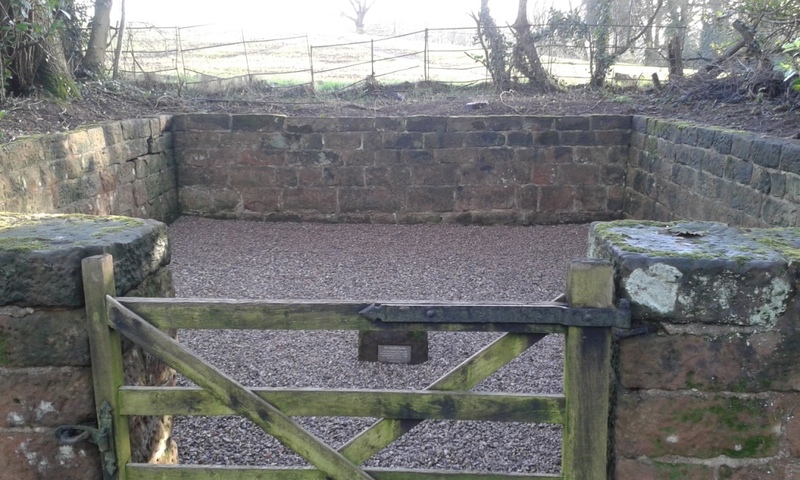 · The fields immediately to the east of Balsall Common, in an area know locally as Barrett’s Farm, offer easy access to the countryside through a network of public footpaths and the Kenilworth Greenway. This will be the subject of a diversion lasting several years whilst HS2 is built but offers a walking route to Kenilworth and Warwick University. It is also a cycle route but official access it currently limited because the only connection at the Berkswell Station end is by public footpaths. · Balsall Common has a green feel to it due to the large number of green verges and trees, particularly oak trees. With around 80 houses Berkswell village represents about 5% of the parish. You can double that if you take properties close to the village such as Berkswell Hall. Originally the manor house this is now apartments with the stables converted to houses. Berkswell village is the quintessential English village with a lovely church, village green, a shop and a pub. However, our village has three treasures not found elsewhere. A large open well from which the village derives its name, a set of leg stocks with five holes and an animal pound. A conservation area, Berkswell village it is protected against the worst of development and is lucky that most of the pretty properties around the green area owned by the Berkswell Charities. The alms houses on the village green owned by the Charities continue to provide low cost housing to those who need it. Indeed about 30% of the housing in the village is “socially provided” housing. Berkswell village has an importance within the parish that is beyond its name and beauty. It is a hub for parish services particularly the school and the very active church and village hall (the Reading Rooms). Berkswell parish has a wide range of small settlements. Historically it was a large parish with a decentralised settlement pattern. This has led to a range of small hamlets and settlements today which today represent about 40% of the parish’s population. 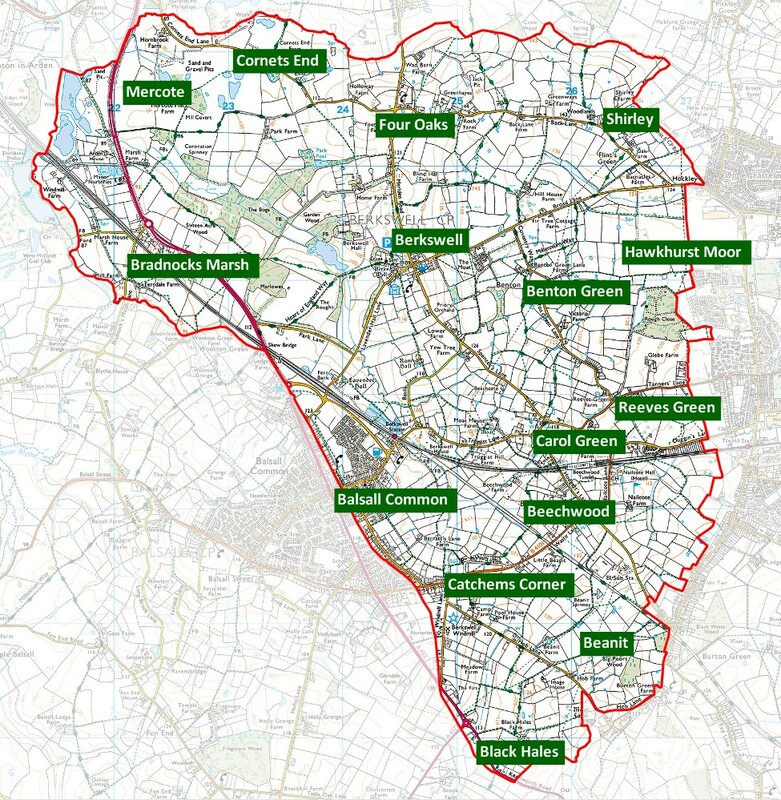 These are all within the greenbelt and therefore to some extent protected from development in the strategically important Meriden Gap that separates the Birmingham/Solihull cvonurbation from Coventry. Historical evidence shows that there was a settlement or community around Berkswell in Saxon times. The village was chronicled in the Doomsday book as an existing settlement. The name of the settlement is believed by some to come from the local chieftain or king called Bercul or Beorcul. He was reported baptised in the local well by travelling monks from nearby Lichfield, became a Christian and built the original Church close to the well site. Hence the name derivation from "Bercul's Well". Others claim the name come from the surrounding Forest of Arden, leading to the possibility the well was surrounded by beech or birch trees, therefore named "Beech Well" or "Birch Well". Part of St. John Baptist Church has Saxon foundations (which can be viewed from the Crypt) and the base of the Preaching Cross is also from around this time. The Church has been rebuilt and added to by subsequent generations, and is celebrated as one of the best examples of Norman and Early English architecture in the country. Associated with the Church since around 1500 has been the local school, still a Church of England school today. In the Middle Ages the manor of Berkswell belonged to the Earls of Warwick. Their crest displayed a bear and staff, which gave name to the local inn, The Bear and Ragged Staff, but now known as The Bear Inn. The park at Berkswell was originally granted by Henry I to Henry de Newburgh, Earl of Warwick (around 1120), to provide game for hunting. It continued with the Earls of Warwick, until 1557. Various families (Marrow, Wilmot, Walker and Wheatley) owned the manor, building many of the features of the village as it is now. Parts of The Bear Inn are 16th Century, Berkswell Hall was built in its present form in 1815, and the Reading Room was built in 1901. The remnants of the original manor, now known as Berkswell Estate, are currently in the hands of the Wheatley-Hubbard family. The nearby settlement of Balsall Common, sited on the Kenilworth to Lichfield road originally sprung up around what was then called Dockers Road but now known as Station Road. A butcher, two pubs a village stores formed a core for the development of Balsall Common, particularly the Sunnyside estate and Dockers Close. The history of early manufacturing is recorded in Brickyard Close and the adjacent Brickmakers Arms. The clay subsoil of Berkswell Parish providing the raw material for this important local industry in days gone by. Balsall Common has developed rapidly in the last century and spilled over the parish boundary line. There is now a newer, more urban part of Berkswell parish which adjoins Balsall Parish. The latest large housing developments were built in the 1990's at “Berkswell Gate”, on what is now known as Hallmeadow Road. At the southern end of the Parish, a windmill has stood on this spot for 400 years giving the road its name “Windmill Lane”. This mill was built in 1826 using the timber from the first mill. Recently restored, it can be visited on the first Saturday every month from July to October. The subsoil of the Parish is clay, formerly dug for marl and bricks, which is reflected in the deep and sometimes heavy soils. Sands, gravels and pebbles overlay the clays, particularly in the north and west of the Parish. These were deposited during the Quaternary Glaciations, when the area was covered by a great meltwater lake (Lake Harrison). This geological history has resulted in a largely flat topography. Historically, the Parish was covered by the Forest of Arden. However, as the Forest disappeared, it gave way to a landscape of small fields and hedgerows with a sprinkling of small woods and copses. Pre-dating the Doomsday Book, Berkswell Estate still covers a large part of the Parish. Although reduced in size by being broken up in 1888, the main estate, measuring over 1620 acres, has continued to be managed as a country estate until the present day. This has helped to preserve the rural nature of the Parish, as well as its rich local environment. The estate still contains the remnants of the pasture woodland of Berkswell Park, dating back to at least 1322. The estate also contains a marshland "site of special scientific interest" or SSSI. Most of the hedgerows in the Parish are species rich mixed hedges and are believed to be of considerable antiquity. Many of the woods in the Parish are ancient Pedunculate Oak/Hazel woods. Small leaved lime occurs in several woods, and in most the ground flora is characteristic of ancient woodlands. Rough Close, off Tanners Lane, is the best example of lime woodland in the Parish. Now used as the official campsite of the City of Coventry Scouts, the earliest reference to the woodland at Rough Close is from the Berkswell Glebe Terriers, a selection of documents dating from 1612 to 1832. In 1698 it was referred to as adjoining Parson's wood, and in 1722 it was recorded as "also commonly called the Parson's Wood". Rough Close was also shown on Yates' Map of Warwickshire from 1793, as well as Greenwood's Maps of Warwickshire from 1822. There are several lakes within the Parish, including one in the grounds of Berkswell Hall and the lakes at Lavender Hall fisheries, which were artificially created a decade ago. There are many small streams. Small field-ponds are also very numerous and are characteristic of the area. Most will have been created by farmers wanting to spread marl on their fields, and they may often support a wide variety of plant and animals. However many have been adversely affected by shading, fertiliser run-off and tipping. In addition to these locally important sites, several wetland and marshland areas are notable for their regional importance. The sand quarries at Cornet's End are important for birds, supporting regionally important breeding colonies of Sand Martins and Little Ringed Plovers, as well as supporting over-wintering wetland species. The pools have been found to be rich in aquatic invertebrates. This site is owned by the Packington Estate and lies adjacent to and in the flood plain of the River Blythe. This was formerly an area used for the extraction of sand and gravel. Since conclusion of the quarrying in 1999, the land has been re-instated. It now consists of two main pools together with woodland, grassland, ponds and some agricultural land. The pools have been shaped and include a number of islands, which, since formation, have attracted a wide range of breeding and passage waders, many of some note. The River Blythe crosses the western side of the Parish and is considered to be a particularly fine example of a lowland river on clay. A 39 kilometre stretch was designated as a SSSI in 1989. Botanically, the Blythe is one of the richest rivers in lowland England. The river supports a diverse invertebrate community with s wide range of molluscs, oligochaetes, dragonflies and caddisflies. This site lies to the east of Marsh Lane Nature Reserve, on the opposite side of the A452 (Kenilworth Road). It forms part of the Berkswell Estate and was notified in 1999. The site is made up of an area of fen meadow bisected by a tributary of the River Blythe and two blocks of wet woodland. The marsh forms the largest known example of fen meadow in the West Midlands County. The rural Parish of Berkswell is located within the Meriden gap and is largely in the Green belt. It thus enjoys the protection of established planning policy which maintains that any development therein is inappropriate unless for the purposes of forestry, outdoor recreation or cemeteries. Any other development must provide very special circumstances for it to be permitted. The village centre surrounds the Village Green, with Church, shop, tea rooms, almshouse, school and houses overlooking it. The Bear Inn is located on the junction of Spencers Lane and Coventry Road, and a 1960's development (Pound Close) sits between the pub and the original animal collection pound on Coventry Road. The older residential areas around Station Road, Meeting House and Kelsey Lane comprise largely of 1960s and 70s developments alongside older properties. There is a large variety of character, style and quality amongst these properties. A lot are located within very large gardens, there are old and new apartments, demolitions and rebuilds and many windfall developments. The road system in the Parish is made up of small roads and lanes with one exception, the A452 - which is a dual carriageway. These small roads have developed over the years from footpaths to meandering country lanes, which were primarily used for agricultural vehicles and local access to houses. The A452 between Skew Bridge and the Meriden roundabout represents a collection of residential and commercial properties on the left side heading North and agricultural land of the Berkswell Estate on the right. The potential for mineral extraction exists on the right side of the road.